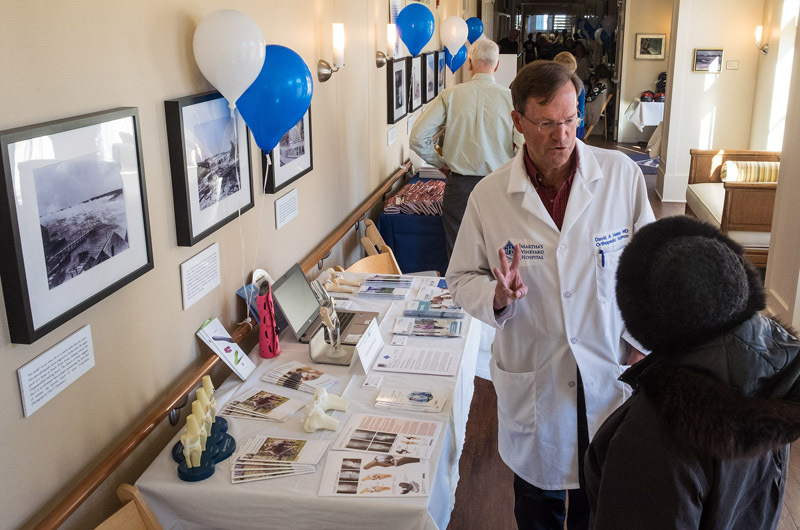 Make no bones about it: orthopedic surgeon Dr. David Halsey hosts information booth at hospital health fair. 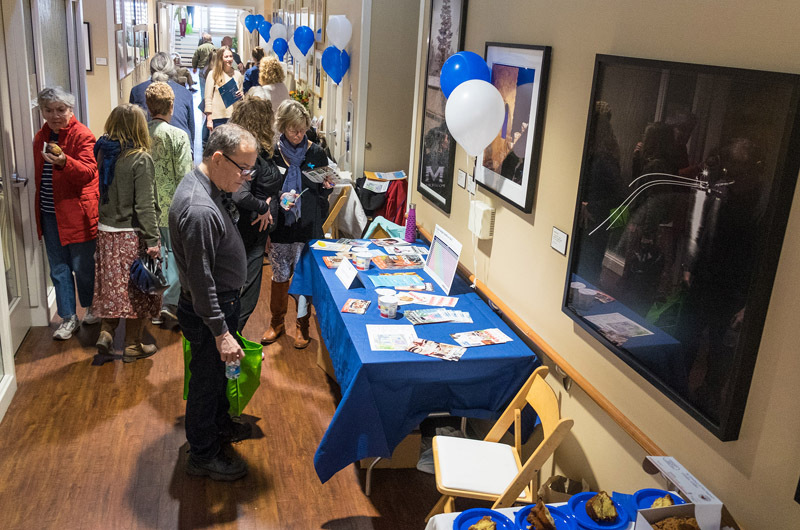 From fitness to family planning, there was something for everyone at the Martha’s Vineyard Hospital 22nd annual health fair Saturday. There were demonstrations, screenings, information and handouts. At one booth Sophie Abrams and Mary Sage Napolitan, representing Island Grown Initiative, encouraged people to sample pea shoots and strawberries grown in the Farm Hub at Thimble Farm. In a room nearby, a woman had her teeth cleaned by a Harvard dental student. Down the hall, Island optometrist Dr. Ryan Shea tested a woman for glaucoma with a machine that blew a puff of air into her eye. At another booth, Oak Bluffs paramedic Lindsay Hopkins demonstrated the LUCAS 2 chest compression system, using a dummy. The machine is used for CPR. Ms. Hopkins said using the LUCAS keeps the compressions uniform and allows for compressions to continue during transport. Currently there are five machines on the Island and they have been used for about five years, Ms. Hopkins said. Use of the machines has increased survival rate by about 60 per cent, she added. The hospital just received funding to buy a LUCAS system for the emergency room through an anonymous donor, said Michael Hargan, a nurse manager. About 200 people attended the health fair, according to Rachel Vanderhoop, director of development for the hospital. She was especially pleased by a high turnout of children. Crowd favorites like the MedFlight helicopter returned, while new interactive events including a yoga class for children in the morning rounded out the fair. Most importantly, Ms. Vanderhoop said, the fair brought together medical providers for the Island with the community. “It’s just a good opportunity for all the providers on the Vineyard and those off-Island to get together and have the community come in at a time when they don’t need to be at the hospital, which is the best time to be there,” she said.